Here are some of the best spots in Australia for a snow trip. Located 33 km from Jindabyne, Thredbo Alpine Village is nestled in the New South Wales Snowy Mountains and attracts over 700,000 visitors annually. Winter at Thredbo, weather permitting, starts on the first weekend in June, and the resort offers a wide range of activities both on and off the slopes for people of all ages and experience. Whether you're into skiing, snowboarding, hiking, sightseeing or just some good time snow play, Thredbo has plenty on offer. When the mountain is fully blanketed in snow, Thredbo has the longest ski runs in Australia and offers skiers and boarders over 50 runs to choose from. The resort has a wide variety of accommodation options to suit various group sizes and budget and the village has plenty of bars, restaurant and shops to ensure a great holiday destination for all. Only three hours away from Melbourne, Mt Buller is close enough to make a day trip to the snow perfectly possible, and far enough away to feel a world away from home. The site of Australia’s very first ski lift, installed in 1949, Mt Buller now has 22 lifts running and over 300 hectares of skiable land to suit a range of skill and experience levels. To keep the little ones on their toes, there are two toboggan parks set up and equipment can be hired from the mountain. A huge variety of ski in, ski out accommodation and over 30 bars and restaurants awaits, ensuring you will never be short of a place for a post-ski hot chocolate. For those looking to pamper and rejuvenate stiff muscles after a day on the powder, Breathtaker on High Alpine Spa Retreat is the place to go. Australia’s highest day spa, Breathtaker offers luxurious hot pools, spa packages and steam treatments to indulge and treat the body. Deep in Victoria’s high country, Falls Creek’s ski season runs from the middle of June through to the beginning of October. During this time you will find more than 90 ski runs and 15 lifts servicing alpine thrill seekers. Approximately 60% of the runs at Falls Creek are designated as intermediate, with the remainder fairly evenly split between beginners and advanced, making it a great destination for families and groups of mixed abilities. As well as traditional on-mountain activities, the resort offers loads of other ways to enjoy the snow including snow bocce, snow tubing, high country picnics, snow biking and fun snow dragon shows for the kids. 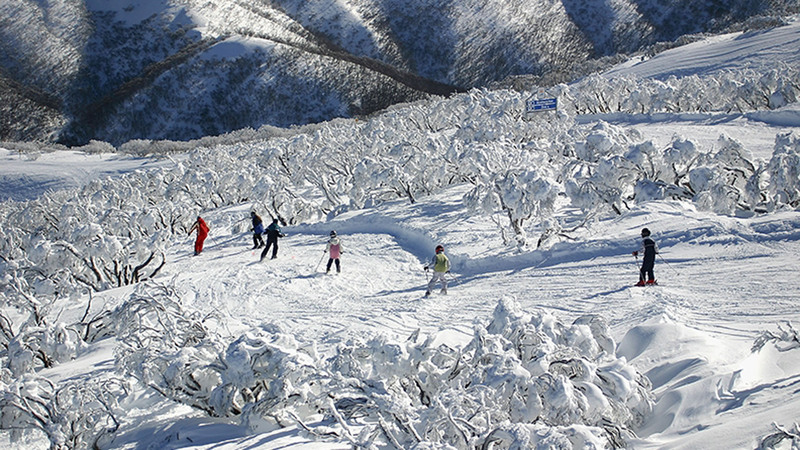 Falls Creek is also internationally renowned for its cross-country skiing routes through the beautiful landscape of Victoria’s high country. Dedicated snowshoe trails are also available. Found in the heart of Tasmania’s Ben Lomond National Park, the winter season at Ben Lomond Ski field Area starts late, around mid July. Only 60 km from Launceston, Ben Lomond is the only vehicle-accessible alpine resort in Tasmania and is an easy day trip destination. A scenic drive from Launceston takes you up through rain forests and onto the mountain plateau where, on a clear day, there are spectacular views as far as Flinders Island. A small local resort, Ben Lomond runs seven lifts and is a relaxed, family friendly resort with very reasonable prices. The village is located at the foot of the slopes and offers a toboggan and snow play areas for the kids, along with convenient equipment hire facilities, a ski school and a cosy café. Protect your health when you travel with Medibank travel insurance.